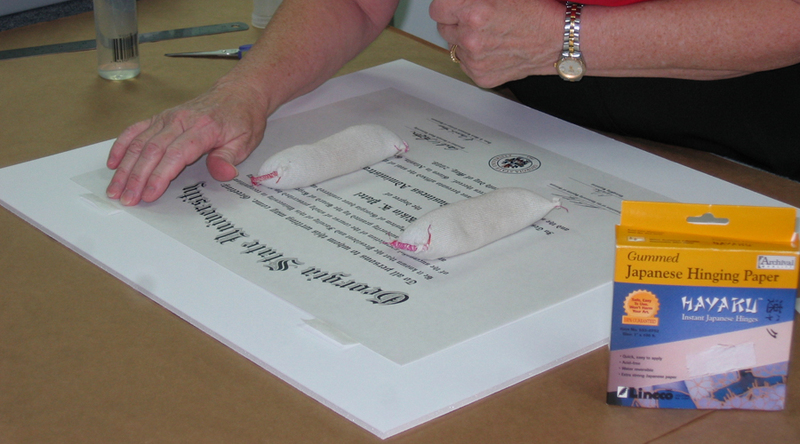 Conservation framing is a technique that utilizes procedures and materials proven to protect and maintain art in as close to its original condition as possible. Nothing will completely protect your art from deterioration. However, we employ these proven methods to slow the deterioration process, enabling your to enjoy your art. Not all paper is created equal! Ordinary pulp-based mat board contains acids and lignin which, over a period of time, damage the artwork they come in contact with. Conservation quality mat board is free of all acids, lignin and other impurities found in ordinary "pulp" board. The result is an inert or pH neutral board. By removing the acidity of the mat board, the artwork does not come in contact with paper that will damage it over time. This goes for the backing or foam board that holds the back of the artwork in place. The idea is to remove your artwork from any "contact" with acidic material that will damage it. 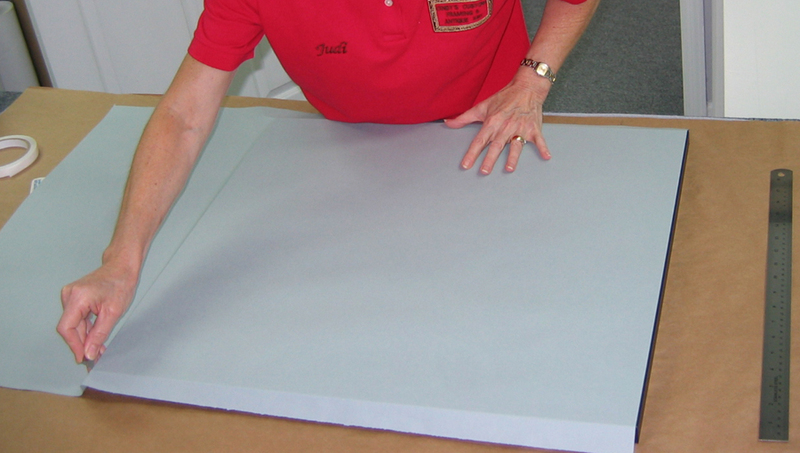 Acid free materials are used to "Hinge" the artwork to the acid free foam board or mat. We strongly encourage the use of hinging paper that is "reversible" when ever possible. A reversible hinge mount allows your to remove the artwork from the backing and remount it at a future date. If the artwork in your collection has been fixed in place with masking tape--then your framer has done you a great injustice. Acid will take its course and in some cases, the tape will blemish the artwork, to the extent that it will bleed through the print. For large prints that are not limited editions or originals, where buckling of the artwork is a problem, we employ a special, acid free material for dry mounting. To the left is an example of hinging tape being applied to an acid free foam board. If you are unsure if your framer has followed this procedure, please feel free to bring in the artwork in question and we will evaluate it for you. Please click on the image for a larger view. Tapes used to seal the mat board to the foam board should be acid free. The potential exist for adhesive materials that are not acid free to "off gas" into the area behind the artwork. This may contribute to the damages to the artwork over time. To insure against this, we use only acid free adhesives. On the left, an acid free double-sided tape is being installed to seal the top mat to the bottom mat. Please click on the image to the left for a closer view. It is important to protect the artwork from any exposure to acidic materials. This includes the frame itself. We seal the inside of the "rabbet" under the glass. This keeps the backing material, the artwork, and the mats away from the acid in the moulding. It's just another step we perform to insure your artwork is protected against the influences of acid materials. Humidity presents another problem in prolonging the life of artwork. Our area experiences rather high levels of humidity for long periods throughout the year. This can be a real problem if the artwork is placed directly behind the glass. Matting offers a small space between the artwork and the glass for air. If the artwork touches the glass, there is the potential for damage. In most cases, art is matted, allowing the air space. In those cases where the art does not have a mat, we utilize spacers to keep the glass away from the art. It's a simple thing, but keeping moisture away from the art also helps to protect against the growth of mould under the glass. You often see this in the form of dark spots. It is commonly referred to as foxing. 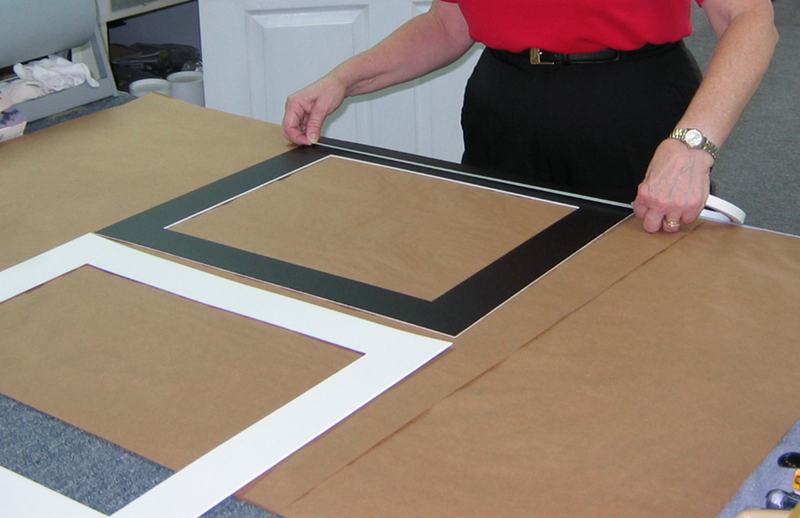 Often, the most overlooked aspect of custom framing is the back of the frame. Most framers use craft paper. It looks like an old paper bag that's sealed on the back. The paper on the back of your framed artwork serves a useful purpose--to protect against dust and insects. We believe in addition to insect and dust protection, the back dust cover should also be acid free, sealed in place with acid free tape. Our acid free backing material is light blue--not brown or black craft paper. The dust cover on the back of all our artwork is acid free and light blue in color. The brown craft paper on the table is what most framers use for backing. If you would like to have the paper changed, please feel free to contact us. For a closer look, please click on the image to the left. One of the sure bets in prolonging the life of your artwork is to hang it with the proper hanger. It may be simply overstated, but keeping your artwork from falling off the wall and sustaining damage is something we take very seriously. 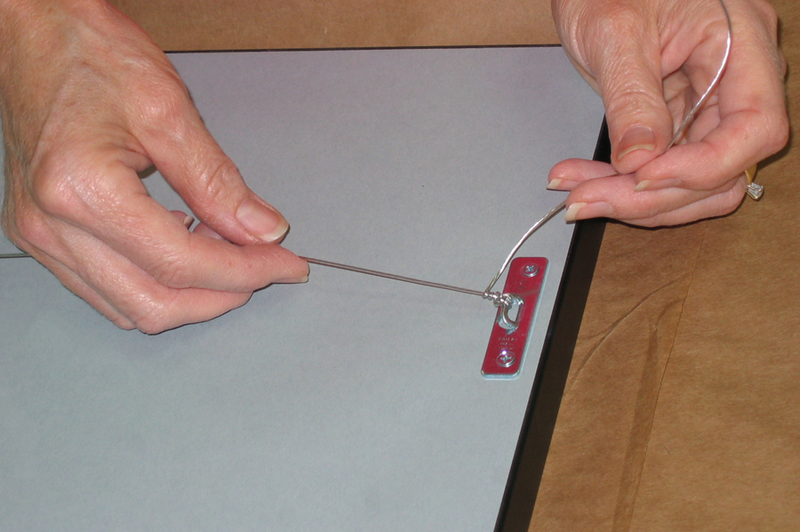 We do not use screw eye hangers for affixing the wire on the back of the framed artwork. We have repaired too many frames that have fallen and been damaged that were hung with screw eye fasteners. The single screw eye has a tendency to work itself out, when the framed artwork is handled frequently, or if the screw eye was not installed properly. First, Ultra-violet light is one of the most damaging elements your artwork can encounter. It not only causes the colors to fade to a mere shadow of their former glory, but it causes the materials themselves to begin to break down right in the frame! Regular, clear glass will not protect your art. This damage is cumulative and irreversible. For proper protection against UV light it is necessary to use a conservation quality glass or acrylic. This glass or acrylic is specially formulated to protect framed works of art from the damaging effects of ultra-violet light. Today's conservation glass and acrylic can block over 99% of these most damaging UV light rays. Simply removing UV light by using UV protected glass or acrylic is one of the most important steps you can take to prolong the life of your art work. Another step is to avoid displaying your artwork where it is exposed to direct sunlight.